Diamond sellers feel disappointed after his diamonds are worth 12 thousand pounds, or approximately Rp166 million (Rp13, 888 per pound), swallowed up by her beloved dog. This incident occurred when George Kaufman plans to sell his diamonds to a buyer. On the way Kaufmann accidentally dropped his diamond weighing three carats. It turned out her dog was attracted to shiny diamonds and immediately devoured. Kaufmann who saw the incident immediately to bring his dog named Sollie to the vet. The man consulted with a doctor to issue a precious stone from the stomach dog. But the doctor advised him to wait until her dog defecate. After that diamonds can be taken by Kaufmann. Kaufmann who do not want a big loss, immediately comply with veterinary advice earlier. For three days he took his dog for a walk every morning and every Golden Retriever-type dog that pee, Kaufmann did not hesitate to scrape dirt dog, hoping to rediscover his own diamonds. Kaufmann effort does not end in vain she finally managed to find a diamond in the dirt dog. 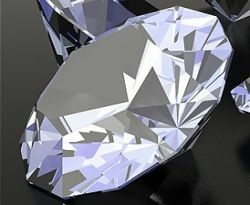 “It felt really uncomfortable, but it must be done to get the diamonds back, ” Kaufmann said as quoted by The Sun, Sunday (14/03/2010).